I have attended and organized a number of academic and professional conferences and have noticed that there are a lot of people who propose and go to these events who really don’t know how to navigate the norms and conventions of them. I know that, whereas many universities expect their faculty and graduate students to attend these events for professional development and the dissemination of knowledge, they don’t actually help them understand how to propose or present. So I have decided to share my personal wisdom on conferences in hopes that those attending get the most out of their experience, and that the conference itself works out. Conferences are great. I will tell you that I absolutely love going to conferences, and presenting at conferences, and yeah, organising them. They are a brilliant opportunity to meet new and interesting people, develop professional networks, disseminate my ideas, and hopefully get the much needed input to make my work better. I also find that the more I present, the more my confidence grows in my subject and my skills. It is a win-win. Be pretty sure you can actually attend the conference to which you are submitting a proposal – check the dates and verify that you can get time-off, subs to cover your classes, etc. Make sure your name and address are on your proposal itself, not just the accompanying email – yes people really do forget to put their names on their proposals! 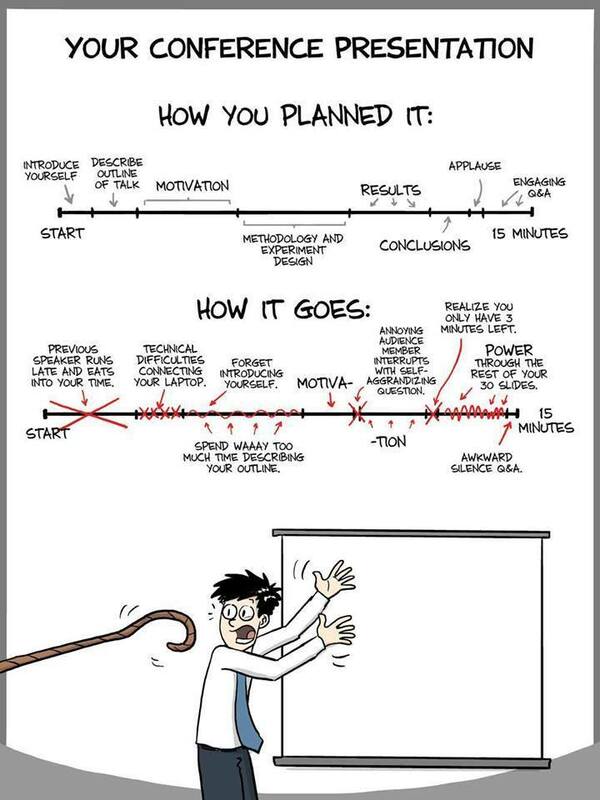 I will be the first to admit that a great proposal is not a guarantee of a great presentation, but it is the only way available to ascertain if it fits in within the conference theme. A good proposal is a great start. I think one of the most frustrating things I have to deal with as a conference organiser is the cancellation. Life happens, and we all get that, but for some reason presenters find it remarkably difficult to cancel their appearance. I think many presenters forget that they are not the only ones presenting. If you are unable to present, then you have to think about the people who are presenting with you. The sooner the organiser knows about the cancellation, the easier it is to adapt the schedule. A lot of the time I get presenters contacting me about the time of their proposal in the schedule. It all depends on the size of the conference, the venue, among other factors which determine how much flexibility organisers have. In general, there is little flexibility. If there are mitigating factors for the presenter, such as religious or medical reasons for the inability to present on the time assigned, then the presenter should as quickly as possible state their problem and hope that it can be resolved. But, in general, I would say to those planning to present at a conference, plan to attend the whole conference, and don’t expect any changes. Even the conference organiser does not get to pick the time of his or her presentation. What happens if you cannot go, and you don’t tell the organisers? One year at PCA, an entire panel who failed to show up. This group had asked specifically for this panel to be organised, and concessions had been made for their appearance. No one showed up. There were no emails or phone calls to the Area Chair, who tried contacting them to find out what happened. No responses were received. So who does that hurt? Well first off, the conference, as people came to the presentation to listen. The room had been booked. But, most of all, the presenters. It is the presenter (s) who are hurt by this. Understand that organisers have long memories – they remember when they are put in a bad position, probably longer than if it was an awesome presentation. Every year, at this conference, we talk about the people who failed to show. Trust me, there is a list, not always official, but it is there. Don’t be surprised if one day the list is published on the organization’s webpage. So far I have dwelled on timeliness in contacting conference organisers, but how you approach them is also important. Conferences are an opportunity to demonstrate your professional qualities to your peers and colleagues. Letters written in a condescending manner, with spelling mistakes, with not enough information, with unreasonable demands, do not go over well. If you wouldn’t like getting that letter sent to you, then it is a probably true that the conference committee would not like it either. So now you have to write your presentation. What do you say? Unless you are given a great amount of time as a special speaker, most presentations at conferences are 15-20 minutes long. That is not a lot of time to encapsulate your ideas. Pare down the argument to the essentials. What is the most important idea that you want the audience to take away from your work? Why is it important? What is your thesis? After a few pages of writing I suggest you stop for a moment, and read them aloud, and time them. Once you have figured out how much text equals how much time, you can then judge how much more to say and perhaps what to cut out. Remember there is always the “questions” part of the session; you can add more information for the benefit of the audience. Don’t write more than you have time for. If you have an extra five minutes of text you will find that either you will rush to try and squeeze it all in, or be stopped mid-sentence and the important statement is never said. Most people now use power point in their presentations. It is both a benefit and a curse. I still have nightmares from the one historical presentation I saw where the presenter used a “follow the dot as I am speaking” option on his power point as if it was a sing-a-long. Oh wow, that was an epic fail! Then there are the presentations I have seen where the image changes practically every second as the speaker scrolls through his document in a bid to show everything. Even if your topic is very visual allow for enough time in your presentation so that the audience can see the images. Try not to be too fancy – simple is always better. I usually plan for a maximum of 15 pages including the title page for a 15 minute talk. The general rule of thumb is thus 1 page per minute. Don’t put your script up in the presentation page, you will find that the audience will try to read it, and won’t be listening to you. Bullet points are more than enough. Images should be relevant to the presentation. Be careful of the size of the image – if it is too small and cannot be blown up clearly, then ditch it. Always find out ahead of time what technology is provided and what you have to bring with you. A lot of venues do provide the projectors, but not always the computers, or the cords to attach these things together. I have found that often this is a problem for those with Apple computers; the venues rarely have the right connectors. Bring it with you. Things happen at conferences – and technology often fails. Make sure that you can present your paper without the power point, just in case the computer dies or explodes, or transports to another dimension. Always print off a paper copy. Also bring cords, usb keys, etc., even when they are not required. Always be ready for something to go wrong. If you are ready for the worst, you cope a lot better, and often it means the worst won’t happen. At the conference make sure that you are at the room on time, if not early. Set up your presentation on the computer, or whatever technology is required, ahead of time. Make your acquaintance with your co-panellists. This is a great way to meet people who are working in the same field as you. Don’t forget to breathe when you present. I often print my speech in such a way that I have to change pages or cards fairly often, and I use this time to look up, breathe, before I continue on with the presentation. Often at conferences the chair is charged with enforcing the time limit. They are the bosses, so keep an eye on the chair or the timekeeper, and make sure you are aware of them during the presentation. And when they call time, acknowledge it, and finish your sentence. 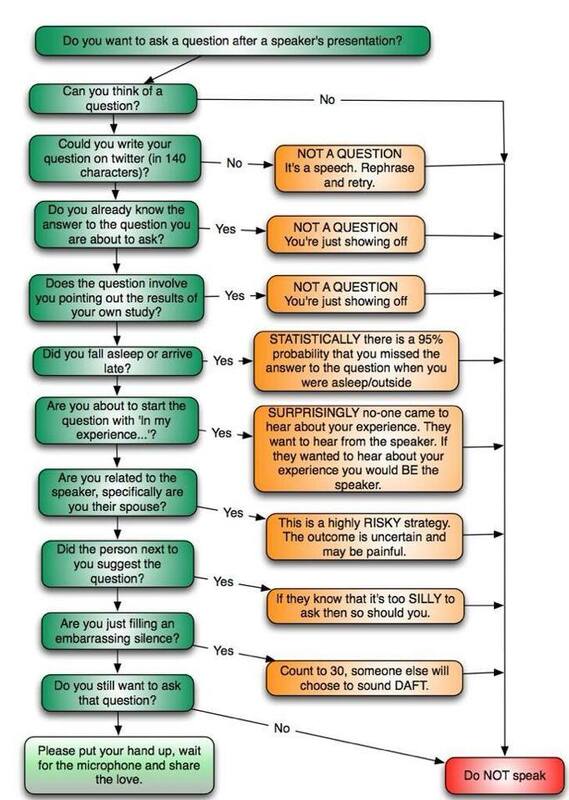 Should you read your presentation? Most people do, but it is a matter of how you read it. I have seen some who take their paper in front of them, lower their heads and then read it all. They don’t look up, they don’t interact with the audience, and they go into the zone. It is better to try and read it with an eye to the crowd, to be a part of the whole. The audience relates better to a person who is trying to relate to them. And, it is really easy to learn to do this if you practice. Not enough can be said about that: practice, practice, practice. Your audience will thank you for it (trust me on this one). This is the opportunity for your work to be discussed, and a great way to see how well you have transmitted your thesis. Unfortunately, the question time can also be a time of great awkward silences, or questions to only one panellist. And there are the odd questions, which have nothing to do with any of the presentations. Grace is the key – accept it all in with grace. If you don’t get any questions about your presentation, and the chair is unable to scurry something up to ask to fill in the gap, don’t take it personally. While sometimes a lack of questions could be because your presentation stunk, most often it is because the audience is there for another panellist, or a specific topic and they only want to know more about that. That does not mean that you cannot ask questions of your fellow panelists and get a good discussion going (in which you might be able to bring the topic around to your presentation. After all, the presentations are grouped because the organiser recognized something in the papers that seemed “to fit together”). When you get a question, try and answer it as succinctly as possible and only answer the question posed. If you cannot answer the question, then be honest, and say you cannot, but try and relate it back to what you are speaking about. When you are asking questions, also try and keep it short. 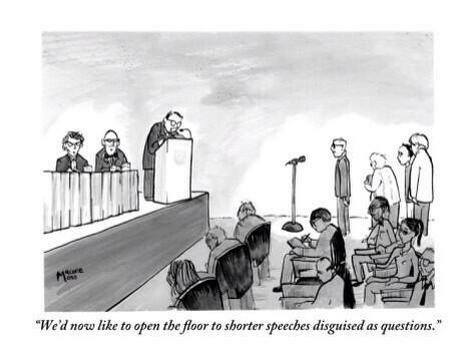 There are probably a number of people who also want to speak, so it is a great courtesy. It will also keep the conversation more lively. If you have more to say to the presenter, then approach them after the panel and talk, or if they appear to be very busy, hand them a business card and ask them to contact you. A short note on the business card about the specific topic would be useful, as business cards are passed around fast and furiously, and when people get home they often forget who the person was or why they got their card. If you are attending a conference because you love the topic, have just started your education in the topic, want to learn about the topic, etc., then make yourself available. Try to attend other presentations in the area and meet the people. Meet the Area Chairs. If there are social events, go to them. It is difficult to do that for some people, but if you make the effort just once, it will be so much easier in the future. Who knows? You might just end up as an organiser one day!